This article covers cookware materials, their properties and maintenance requirements, because understanding the materials and their properties is crucial for achieving the desired results in cooking. During my courses and through your correspondences, I am repeatedly asked about cookware. What makes them different? Which are the best choices? And how to season and maintain them? How do you know which cookware to buy, and for what uses? How do you know which shapes, materials, or makes to go for? Why are some so expensive? Is expensive better? Which cookware are healthy and safe to use? So I made my choice, how do I season it? How do I maintain it?…etc. With the many options available in the market today, selecting cookware can be a bit confusing and to some even stressful. So many questions come to mind and rightly these questions are important to ask before you go shopping. This information is essential because cookware is a basic requirement to food production. Your choice of cookware affects the outcome of the food, its consistency, the flavour, the nutritional content and even the health factor of your food. As importantly it also affects your pocket. Cookware could be the reason for success in cooking or the very element that hinders your progress. An educated decision is therefore very important! So do take the time to read this post, as it will help you decide which type is the best for you. The following list sums up the materials used in making the cookware available in the market today. Subjecting food to heat, changes its properties. This change of properties is what we refer to as cooking. Cooking is in essence “preparing food for eating by heating”. Therefore heat is a very important factor to consider when choosing the material of pots and pans. These materials determine heat conductivity, even distribution of heat, heat retention, heat responsiveness…etc. all of which will determine the amount of time required to cook, and producing evenly cooked foods, as well as avoiding sticking and burning…etc. Different metals, respond differently to heat, and can therefore produce different results. Some metals are very good heat conductors. They heat up fast, and cool down just as fast, which is a property that is very important when preparing delicate sauces, working with sugar and especially when working with chocolate. There are food preparations that require specific temperatures, without which you can never achieve the desired results. For those heat-specific recipes, using a poor heat conductor can prevent you from getting the results you are after, either by having hot-spots that end up scorching parts of your food, or by overheating/ under-heating…etc. Using these poor heat conducting pans will always end up in disappointment. On the other hand, some cookware are poor heat conductors, yet are good with heat retention, such as glass. These will help you retain the heat you have just achieved, without quickly dropping or overheating. Some material can actually oxidize and tarnish, forming a layer of poisonous material that are hazardous when consumed! Solutions and treatments have been devised to get rid of these issues, but you do need to be aware of the care required to keep different materials in top shape. An in depth exploration of different materials and their thermal properties is listed below for you to explore, and to help you decide what is best for you. Some foods are acidic, which can react with the material of your pots and pans. Tomatoes for instance are high on the acid content. This reactivity can produce chemicals that are toxin, and when not so severe can lead food to taste metallic! For this reason, not all material are good to use with all food types. Some material can withstand the short period of cooking without causing the byproducts of reactivity, but cannot withstand the longer subjection to acidity caused by storage! like storing acidic food in cast iron pots for instance! Also known as Pyrex, Corelle, Corning Cookware, Visions Cookware….Glass is a wonderful material that has been used for ages in food preparation. Glass cookware is the safest cookware to use. It is free of chemicals and therefore there is no risk of chemicals migrating into your food from your glass pots and pans. When glass is tempered, it can withstand high temperatures and can even be flame proof. This makes it so versatile as it can be used for baking, stove top and microwave cooking, as well as for storing food and serving. This can also positively affect your storage requirements, as it means you do not have to purchase kitchenware dedicated only for storing food. Glass is non-porous, which means it does not have pores into which food sticks. This means that it does not absorb flavours and odours of food. Therefore your food will not absorb the odours of foods previously cooked in the same glass pot. Glass is non-reactive, so you can use it in cooking any type of food, without worrying about acidity or other reactive properties of different foods. Maintenance wise, glass is easy to clean. It is dishwasher safe, does not require pre-seasoning or any special maintenance routine. All you need is warm soapy water and it is back to new. Glass retains heat longer than metal. As such, it is perfect for waiting time before serving, as food will not get cold fast. Just note that this fact can also be a challenge; as retaining heat means: you will have to cook food for less time, and allow for residual heat to finish up the cooking. Failing to do so can result in overcooked or dry food. Using glass cookware you will usually need to cook at a lower temperature and for a few minutes less than the overall cooking time specified by a recipe. A little bit of practice and getting used to will ensure success. Glass cookware is inexpensive and accessible everywhere. On the less appealing side: Glass is a poor heat conductor, and has hot-spots which can cause food to stick and at times burn in specific places. Glass is also breakable. Tempered glass is less likely to break though unless bashed or knocked down to the floor. These are so eye pleasing and stylish, they come in every colour and shape. They are great for slow cooking and baking and produce deep flavours and unmatched tender textures. The porcelain types offer the best insulation, and can be used for stove top cooking. They come as casserole dishes, gratin dishes, skillets, tagine dishes…etc. Porcelain Ceramics are the strongest of their kind. They are fired, which makes them hard and safe to use on stovetops and microwaves. Note that not all ceramic cookware are stove-top safe. Only the porcelain ones are. Stove top flame heats up real quick and such severe temperature changes can cause damage, breakage and at times pot explosions that can harm the cook. Make sure to check manufacturers’ instructions before purchase. These are dishwasher safe, which makes them easy to clean. They are durable and long lasting too. 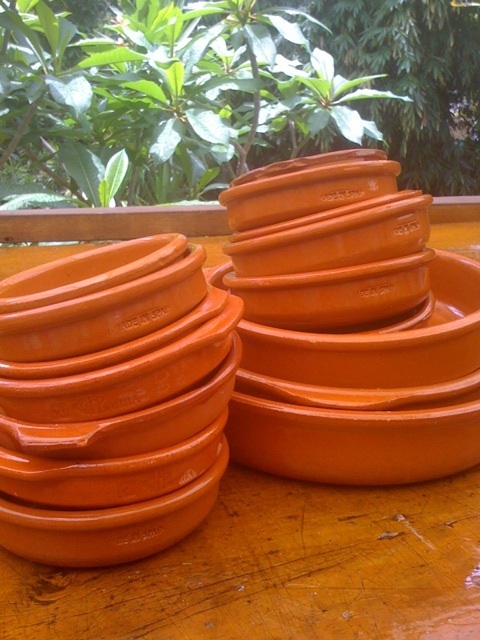 They are versatile as can be used for storage, serving as well as baking and some for stove top cooking. Ceramic is a good insulator and retains heat well. These conditions are ideal for slow cooking: a method that produces very tender and deeply flavoured food. Ceramic Cookware are somewhat heavy, therefore not ideal for stir frying, sautéing or any cooking that requires lots of movement. With that said, the ceramic cookware ranges from earthenware, to porcelain, and those metal cookware that is enamelled with ceramic… all of which vary greatly in properties, and so these are all points to consider before purchase. Otherwise known as Clay, Silsal or Fukhar – is made out of a special type of ceramic or clay, that is then glazed with a special glaze to isolate clay and food. This type of ceramic is less strong than porcelain. It is prone to chipping, scratching and breakage. Therefore, you need to keep a close eye, and when that happens, they need to be replaced by new ones because the actual clay used to make earthenware can have traces of lead and cadmium – which are unsafe to consume – and so they are glazed to prevent contact with food. It is worth mentioning here that some glazes were found to be non-food-safe, and have been graded as not to be used for food production, which means they are not made for cooking or use with food, but rather for decorative purposes. You need to be careful here and make sure that the earthenware you buy is labelled “lead-free” and graded as food-safe. Opt for good quality earthenware from big manufacturers, preferably made in countries where the regulations are strict, rather than the cheaper products, that were recklessly produced and are health hazardous. Good quality earthenware is stylish and produces a wonderful mesh of delicious deep flavours and delicate soft textures especially true with meats. In Levantine and specifically in Palestinian cuisine the use of earthenware is very popular and so it is in some of the cuisines of the Mediterranean such as Greek, Spain, Morocco … For instance, earthenware is commonly used in the preparation of Idreh, a succulent Palestinian dish from Hebron that is mainly a rice, meat and chickpea slow bake. It is also used in preparation of Makmoorah, another Palestinian dish that is mainly a slow-cooked cauliflower stew in yogurt sauce, sealed in the clay pot with pastry to enclose flavours and steam. There are no other pots capable of creating these dishes in the flavours and textures like earthenware does, yet you must always go the safe way and ensure purchasing the right ones! Check out this link for more on Earthenware, how it’s made and how to season the different types of earthenware. The ceramic finish can be applied to steel, cast iron, aluminium, stainless steel or even titanium. This coating usually produces a shiny, finish that won’t rust, peel, scratch or fade. If you like the cooking results established by cast iron cookware, through its even heat distribution, but dread the required pre-seasoning and re-seasoning process, then ceramic enamelled cast iron is the solution for you. This type does not require seasoning, it is smooth and virtually non-stick. It is very stylish and is also dishwasher safe, which is always a plus! Bear in mind that the same “health concern” pointers of earthenware apply here. So go for “lead free” labeled products that are of good quality and originating from countries where the regulations are strict. They are a bit more expensive, but health is more important here. Besides, these are very durable and long lasting, so you can consider this an investment worth making. With ceramic cookware it is important to know that you should never place an empty dry pot on heat. Before placing it on the heat, it must contain an ingredient, fat or liquid to prevent damage. Another note worth mentioning, Do not use metal utensils with ceramic wear as it discolours the surface and might scratch it. It is better to use rubber or wooden utensils instead. Aluminium is a very popular metal used in cookware. Aluminium is lightweight, and an excellent heat conductor. It is rapidly heated and distributes heat evenly. That means that there aren’t hot-spots to worry about in aluminium, and that when cooking in this cookware, you are sure to get the food evenly cooked, at steady temperatures. Aluminium is second only to copper in its thermal properties. With that said, one of the major concerns about aluminium cookware is that it is highly reactive to food and especially to acidic content (acid comes from foods like tomatoes, vinegars, wines, citrus…etc). Added to that, the fact that the longer the food is cooked or stored in aluminium the more of the metal is released into that food. This leads to an unpleasant metallic flavour! Furthermore, this raises a serious health concern as large amounts of aluminium in the blood is very unhealthy. It has been said that individuals exposed to much aluminium are more likely to suffer from Alzheimer disease. Exposure to aluminium is almost impossible to avoid as it is a very abundant element in nature (found in water, cosmetics and food dyes…), however it can be substantially reduced. Therefore, get rid of any old aluminium cookware, and if you are looking for its cooking results and conduction go for the modern alternative: the hard anodised aluminium. Hard anodised Aluminium had gone through an oxidation process to create a non-reactive, hard surface which prevents any reaction between the aluminium and the food. This option is healthier than non-anodised aluminium, yet retains the same cooking properties of aluminium cookware. By far the best cookware where heat conductivity is concerned! Not just because it is beautiful (although there is that too!) but due to its properties, as copper cookware is by far the most superior metal in heat dispersion, ensuring fast and even heat distribution, which makes it the most preferred choice of home-cooks and professional chefs alike. 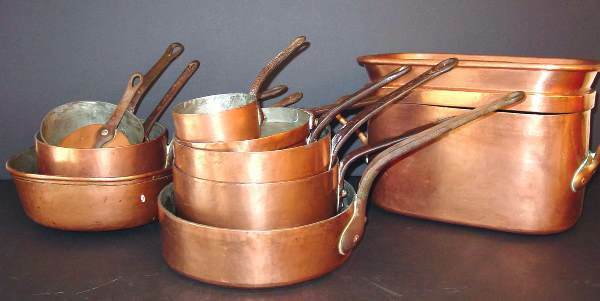 Copper is an expensive metal, and therefore the cookware is expensive. However, copper lasts literally a life time, and can even be passed on through the generations if maintained properly. Therefore, owning copper cookware is always an investment worth making. Copper is the best choice for cooking certain foods, especially for those recipes that require controlled temperature. It is perfect for browning sauces, for tempering and working with chocolate…. it is good for sautés, and frying as well. The quick heating and cooling of copper prevent delicate foods from overcooking, and require less energy consumption, which makes it an environmentally friendly option too. Aren’t they gorgeous! Since copper is such a good conductor of heat, always cook on medium high instead of high, and always cook with less heat than required. Copper reacts with the moisture and oxygen in the air, which causes stains, tarnish and discolouration. It, therefore, requires regular polishing and care. If you are not going to commit to this maintenance requirement, it is then best that you choose another cookware. It would be a waste to purchase copper cookware and not care for it. Besides, tarnish is a poisonous byproduct, and you do not want it to get in contact with the food. Added to that, salty foods cause a reaction with copper that gives the food a metallic flavour. For these reasons, the cooking side of copper cookware is usually coated with tin, silver or a stainless steel coating. This isolates the food from the copper, as unlined copper results in unsafe amounts of copper in the food, which this is warned against by FDA. Don’t use copper cookware if the lining is significantly damaged, as it will lead to the metal being released into the food. Also bear in mind that tin melts at 450F, and can wear off over time. When that happens you can send your pots and pans to a re-tinner to get re-tinned, it will then look and function as new. 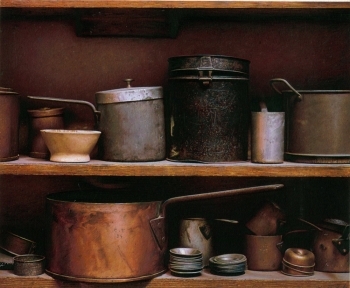 Chefs and copper cookware enthusiasts usually make sure to maintain their copper cookware and keeping it in top shape. This maintenance of copper cookware became very easy with all the specialty cleaners available in the market today. For new copper cookware, before the first use, fill with water and add aromatic herbs or green vegetables and bring to a boil. Remove from heat, discard all, and dry the pot/pan thoroughly. Never place copper cookware overheat while empty or dry. Always add liquid or fat beforehand. 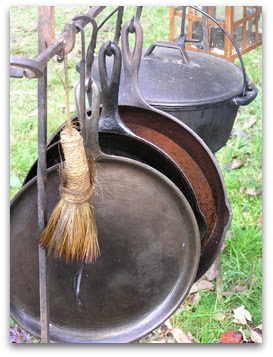 Never scrub copper cookware, instead wash with hot soapy water and shortly soak. Copper cookware is not dishwasher safe, never put it in the dishwasher. Harsh detergents and chlorine damage the copper and causes it to pit. use gentle soaps instead. 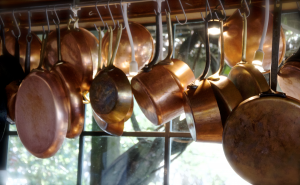 Frequently polish your copper cookware with specialty cleaners. Never leave copper to air-dry, it causes staining that become impossible to remove. Instead, towel dry directly after washing. Use wooden and rubber utensils. Never use metal utensils unless lined with stainless steel. 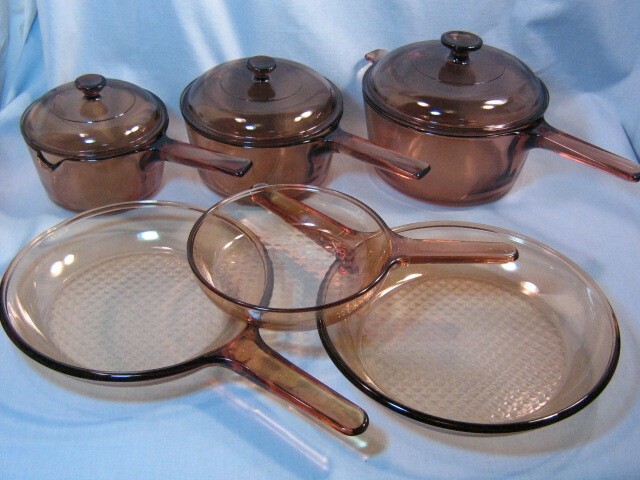 Don’t use copper cookware to store food, and don’t cook acidic foods in unlined copper cookware. Dark blotches absorb more heat than their shiny alternatives. This causes hot spots, which leads to uneven cooking of food. Use proper copper cleaners to shine your copper regularly and get rid of spots and stains. These cleaners act as anti-oxidants and remove spots without the need for harsh scrubbing. Don’t rinse the sponge used for polishing copper, this interferes with the chemical reaction required to shine and polish your copper. Rather, squeeze out the cleaner, and store in cool dry place. 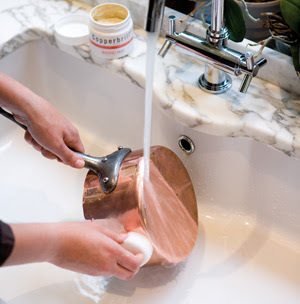 It is always best to use professional cleaners, but when not available or accessible, you can make your own copper cleaning paste: Just mix water, salt & flour into a paste and rub the cookware to keep bright and shiny. For heavy dark marks, it has been mentioned that spreading ketchup and leaving it for a few minutes then rinsing with hot soapy water works. The acid from the ketchup helps to remove the stain. if you prefer to retain the natural patina that appears over time instead of the shiny look of new copper cookware, use lemon and coarse salt to rub cookware revealing the original less shiny copper. If you purchase copper cookware that’s been coated with tarnish-proof lacquer, you must remove it before using, by dissolving it with lacquer thinner which you can buy from hardware stores. Failing to do so will result in permanent spotting which affects the look and cooking quality of your copper cookware. This is the best option for home cooks as these are easier to care for and are very durable. Metal utensils are OK to use with stainless steel lining. Before the first use, season stainless steel lining by applying a thin layer of peanut oil with a kitchen towel, heat until just before the oil smokes. Remove from heat and cool completely. Rinse with warm water and towel then dry immediately. You won’t need to re-season stainless steel lining, unless you use abrasive detergents, which will remove the seasoning. Then you will have to re-season. Note: Do Not get the oil on the copper side, as it will be very difficult to remove once heated. For the cooking properties of copper but without the required extra work, use copper bottomed cookware, which offers excellent conductivity, less work, and is less heavy. Another option would be the copper-core cookware, that is cookware that has an aluminium core with internal layers of copper on the bottom and sides, and all surfaces are lined with stainless steel. Nothing browns meats like cast iron. They are perfect for searing, and any browning effect. 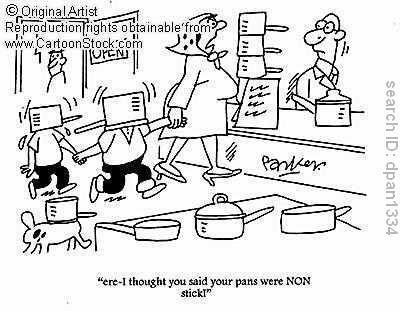 These pots and pans can literally be passed on from generation to generation and have a life time warranty! Cast iron cookware actually have a health advantage as the iron is introduced into the food cooked in cast iron, which is a good way for the body to take its dietary need of iron. Note that as the content of iron is doubled when the food is cooked in cast iron, this quality is lost when the cast iron is enamelled with ceramic or any other coating. A well seasoned cast iron cookware offers a perfect surface for even cooking, browning, creating concentrated flavours and is also beneficial for your health! What more can pots and pans offer? Iron heats slower than other metals, but it distributes the heat more evenly and maintains that surface heat more steadily than the other metals. These properties make it perfect for browning, pan broiling, slow stewing, and even baking. If you put cold food on copper or aluminium, the food transmits this coldness to the pan, reducing the thermal shock necessary for searing. Iron will hold the heat and will produce a smoking sear and caramelisation like no other metal. This heat retention is also good for low, slow cooking required for producing fabulous stews, which are best cooked in cast iron Dutch Oven. Residual heat will also continue cooking the food, and makes this type good for deep frying too. Cast iron Cookware include, stove top and oven cookware, that ranges from griddles, grills, skillets, Dutch oven, roasters, broilers, fryers, and muffin pans… You can also get a cast iron weight with a non-conductive handle to facilitate browning meats on both sides! For some, cast iron cookware can be challenging, as it is heavy, and not dishwasher safe. Cast iron is also reactive to food acidity, and it can increase blood iron levels (which is a good thing but can also be too much for some people with specific conditions). And you cannot boil water in cast iron cookware. However, The most challenging part to many people is the fact that cast iron cookware has to be seasoned before use. Cast iron requires different care than other cookware, and for some, the time and patience required to season cast iron is a deal breaker. Cast iron is only second to copper, which is the most work of all. But to cooking enthusiasts and perfectionists, it is a must have cookware. To avoid seasoning trouble, you can go for enamelled cast iron cookware. Just bear in mind that the addition of the non-stick interior and the porcelainised exterior make cast iron easier to care for, but take away the browning ability, which is cast iron’s most desirable quality. With that said enamelled cast iron is dishwasher safe, and is versatile, as you can use it for food storage, on stove tops and ovens. They are also very stylish with all the bright colours they come in. They allow for low-fat healthy cooking, fat-free cooking since they are non-stick.On the other hand, a well-seasoned cast iron cookware is virtually non-stick too, so you don’t need the non-stick coating if you are up to the extra work required. When selecting cast iron cookware, go for good quality cookware. I personally prefer metal handles, this way it can move from stove top to oven, as wooden/plastic handles can’t be placed in the oven. Just be careful as you need your mittens close by and do not attempt to hold the metal handle without mittens! When seasoned right, cast iron cookware is a pleasure to use. It becomes non-stick and produces food that is perfectly done. Before the first use you need to pre-season your cast iron cookware. Wash with hot soapy water, and dry thoroughly. Place the oiled piece in a preheated oven (high) upside down and bring it to smoking. Remove it from the oven and reapply a layer of the oil and heating it to a smoking again. Repeat the process 3 times. Your cast iron cookware, should be properly seasoned this way. The pre-seasoning fills the pours with oil, therefore, sealing them and creating a non-stick surface. 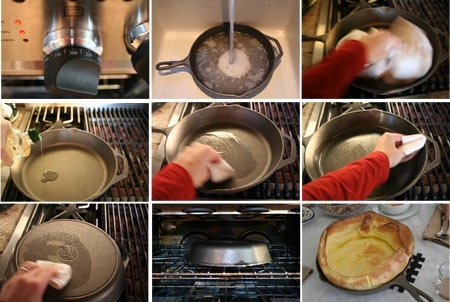 Unless you continuously use your cast iron, you will have to wash it after use, and re-season when ready to use again. If you use it regularly and continuously, then you don’t need to wash and re-season, you can either wipe it clean, or rinse it with water and thoroughly drying it. This way, it just gets re-seasoned with time and with every use. But please note, it is more hygienic and safe to clean your cast iron and re-season, than follow the self seasoning no wash technique, to avoid the oils on it from going bad and becoming hazardous! For long storage, it is best to be washed properly, completely towel dried, then seasoned, cooled and wrapped with nylon or plastic, then put away. Cast Iron should not be subjected to extreme temperature changes. Therefore before starting to cook, preheat it in an oven before placing it on a red hot eye of the stove top. In the same way, never place a hot pan in cold water to cool it off, this will break your pan! To check if your cast iron pan is preheated and ready to use, drop a couple of drops of water on the hot surface, they should boil quickly and dance or jump on the pan surface. This means your pan is ready for searing. if the water evaporates quickly, that means it is too hot, remove from heat and cool down slightly. If the water lingers at the bottom, that means it is not ready to use and not hot enough. To care for your cast iron cookware run hot water over stuck food to loosen. bear in mind that scrubbing removes the seasoning layer and you will need to re-season. After hand washing, dry it thoroughly with a towel and never leave to air-dry or it will rust. Place it on low heat stove to get rid of the excess moisture. Once all the moisture has evaporated, coat it with a thin layer of oil before storing. If stored for a long time, don’t forget to wrap with plastic and sealing it, to avoid rusting. Stainless steel is probably the most popular cookware nowadays. 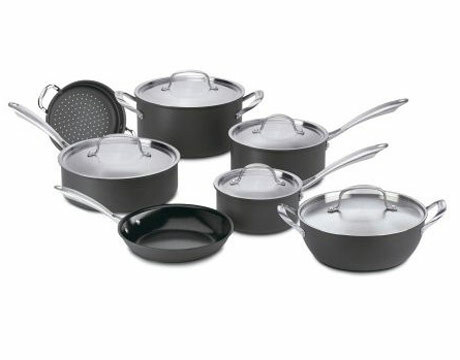 Fairly; it is a low-maintenance easy to use cookware that is both very durable and very safe. It is non-reactive, non porous, and does not tarnish, crack or dent. The shiny silver finish makes it look appealing and professional. Furthermore; the fact that it is stainless steel, means it does not need polishing, or any extra care to keep it in mint condition. This cookware is virtually non-stick. It is, therefore, not necessary to season it. However if you do pre-season it once, you can achieve perfect non-stick results. Unlike cast iron though, you do not have to season and heat 3 times, it is enough to do it once. Stainless steel cookware can have plastic handles and plastic lid parts, or it can be all stainless steel. It is best you go for the all metal option, this way you can move from stove to oven without having to change pots. With that said, if you have bought ones with plastic parts, and since they cannot go in the oven, you can still carry out the seasoning process on stove top. Stainless steel is dishwasher safe and does not scratch easy, which is very convenient, as this means you can use metal utensils with it, without worrying about scratching. It also means that storage becomes more convenient, especially for those lacking storage space; as you can pack them inside each other without worrying about damage. This is key when considering new cookware. Since stainless steel is a poor conductor of heat, it is usually bonded with other more conductive metals to produce ideal cooking properties. It is also used as a coating for other metals due to its nonreactive nature, and this way it acts as an insulator. Its non-reactive nature also means that it can be used for storing food as well. Stainless steel contains small amounts nickel and chromium, which are non-hazardous in these significantly small amounts. However, some people are allergic to nickel, and they should not consume foods with nickel. 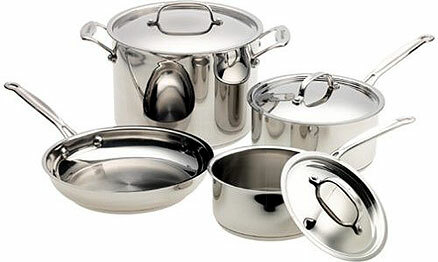 Nickel allergic people, should go for “Nickel-free” stainless steel cookware, which is also available in the market. 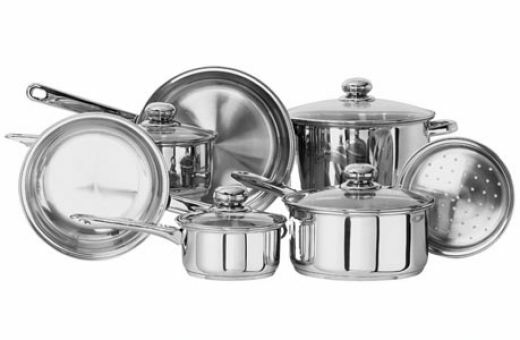 Nickel-free stainless is less shiny than its counterpart stainless steel cookware, as nickel is responsible for the signature shine of stainless steel. To make stainless steel yet more appealing and durable, surgical grade stainless was developed. Surgical grade stainless steel is a combination of metals like iron, chromium, nickel, and can have aluminium, copper or both at the bottoms and sides. The inclusion of those metals ensures even cooking without hot spots, and since Stainless steel is a poor conductor of heat, these metals help in rapid response to heat changes, making this grade of stainless steel the best quality of its kind. When it comes to choosing stainless steel cookware, and as with all other cookware, quality is very important and makes a huge difference to the cooking results. Usually you will find a mark on this cookware “18/10 Stainless Steel cookware”. 18 refers to the percentage of chromium, and 10 to the percentage of nickel. Real stainless steel will have at least these percentages. Anything below that is poor quality stainless steel. Don’t pick pots that have less than 10% nickel, as that makes it harder and more temperature resistant . T403 is the surgical grade stainless steel and is the best quality out there. Other Marks on Stainless steel cookware are the “ply”, “bottom clad” and “waterless”. 2 ply Stainless Steel means there are other metals on the outside and stainless steel only on the inside (cooking surface). 3 ply Stainless Steel means there is stainless steel on the outside and inside with other metal as core. 5 ply Stainless steel means there is stainless steel on the outside and inside with 3 layers of aluminium as core. Bottom Clad Stainless Steel means solid stainless steel with 3 layers of conductive metal applied only at the bottom. There are also ones that have a metal disk attached at the bottom, but these do not perform as well as the former 3 ply stainless. 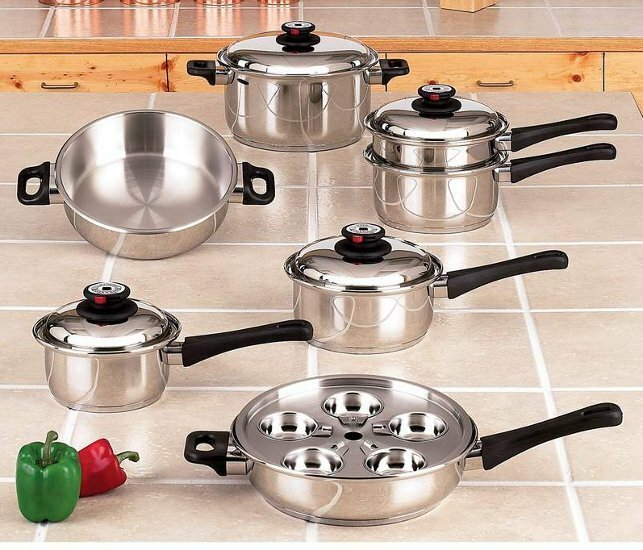 Waterless Stainless Steel cookware is the highest grade stainless steel cookware in the market and the most expensive type too. It is the safest and healthiest cookware there is. There are up to 9 layers, but 3-5 are the most common. Caring for stainless steel is very easy and convenient. Wash it with warm soapy water and scrub with a nylon scrubby. It is best not to leave any cookware to air dry. Long term exposure to salty water is the only threat as it can cause pitting. Therefore make sure to wash them thoroughly, this way they will last for a very very long time. With all that in mind, Healthy cooking and health benefits and hazards are the most heated debates. Secretion of metals, and Teflon into foods and the resulting side effects are always a concern and a source of conflict. I know, I take “healthy” into consideration, and prefer healthier, echo-friendlier products over their unsafe, unknown, and environmentally challenging counterparts. I am sure many share my concerns. At the end of the day, who wants to cause family, clients, or themselves any harm? Non-stick cookware had been exhaustively debated over the years, due to the fact that Teflon coating is the most commonly used in non-stick cookware, and nonstick cookware includes many chemicals that are considered dangerous. Not to make this part too technical and not to dwell on all the chemical compositions, in short these hazardous chemicals are released into the food we consume, and when heated to certain degrees produce toxic gases that are fatal to pets especially bird pets and cause flu-like symptoms in humans. However, there are reports that say it is completely safe if used on medium-low heat, and should never be used in high heat as they become dangerous! Problem is, how many people are aware of that when buying their non-stick cookware? How many average cooks know the exact temperatures of their pots and pans while cooking? Therefore, even if it is safe at “specific temperatures” why do you want to risk the leaching chemicals migrating into your food? 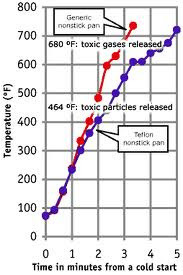 Please take the time to research why non-stick and Teflon are dangerous, as it is a very big and highly debated subject which is hard for me to cover here without going into the detailed and tedious scientific facts. I strongly recommend you do so at your own convenient time, and educate yourself as this is vital to your family’s well being. If you own non-stick cookware, make sure to use wooden or rubber utensils to avoid scratching which will remove the coating and expose other metals and chemicals. If your non-stick pots and pans are scratched or pitted, stay safe and toss them. They need to be hand washed with warm soapy water without vigorous scrubbing to stay in good condition. It is not advisable to use spray oils with non-stick cookware as it forms a film that is hard to remove. Whatever you do, make sure not use over high heat, and not to use these for deep frying, candy making, sugar works…etc. The need for non-stick is still covered by ceramic enameled or a properly seasoned cast iron pan, and many other cookware options covered here. Most chefs everywhere go for those options rather than the non-stick cookware option. Non-stick is not durable anyway, so although cheap, end up costing you the same as the expensive cookware as you will have to keep buying new ones. Not all your pans and pots need to be non-stick anyway, and for those preparations calling for non-stick other options can cover that need. Titanium is in! It seems to be the newest kid on the block that is determined to make it big! 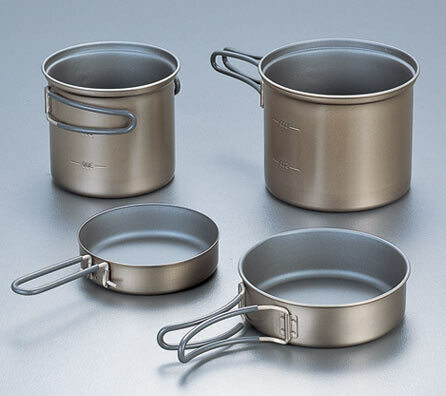 Titanium is super light in weight, incredibly strong, dishwasher safe, healthy due to absence of PFOA, extremely non-stick therefore facilitates healthy cooking without the hazards of non stick coatings, which again allows for the reduction of fat and the added calories required with other cookware. There are in the market titanium cookware designed for those dieting or trying to minimise fat intake, which clearly state no need for oil anymore! Titanium is also the solution for allergic people as it does not include nickel or any other allergens, and is non reactive which keeps food safe. Titanium is also easy to clean (no need to scrub), it does not dent, scratch, tarnish or anything of that sort. Storing it is super easy, no special conditions required. Topping all that, Titanium cookware facilitates cooking on the go! it is super light in weight, so you can carry it in your bag if you are backpacking, camping, or going on a picnic…etc. This is in fact very important for adventurous people who like to cook for fun, travel and cook or are into life on the move! This is why titanium cookware is very famous amongst extreme sportspeople, campers and the wilder ones, thus acquiring the positioning of the extreme lifestyle. The only issue with Titanium cookware is hot spots. Nothing is perfect! If you keep tossing, turning and stirring your food, this will not allow scorching and therefore reduces the effect of hot spots. Titanium is therefore excellent material for woks and sauté pans, as stir frying and sautéing involve techniques that keep food moving inside the pan. A little bit of tossing and turning does the trick! Silicon is the newest addition in bakeware. It comes in many vibrant colours, and is very versatile, as it can be used in the freezer, fridge, oven and is dishwasher safe. The best thing about silicon is that it is wonderful with limited storage space as it can be rolled and tucked away requiring minimum space. Silicon facilitates food release, as it is non stick, which comes handy when making cakes and especially when used as chocolate moulds. Silicon Mats make a perfect base for baking. Besides being non-stick and therefore requiring no grease, they give the base of your baked goods a professional patterned look. When using Silicon bakeware and because silicon is mouldable, you will have to place it on a sturdier base like a cookie sheet to avoid spillage and for ease of taking in and out of the oven. On the more challenging side, there are some debates about the health concerns when it comes to silicon, as it is new and not much is known about it. It has not been conclusive yet, whether or not silicon poses a threat to our health. Silicon can sometimes lead to uneven baking as well. It remains to be seen how silicon excels in the world of bakeware. Another thing to consider is care and maintenance, as some cookware will require a bit of work and some of your time and attention. If you can commit to the work, then perfect! Go for copper as it is unmatched, and the best technically as well as a beautiful option. At least 1 cast iron piece is a must, nothing will match the browning effect. Just make sure you season them well. Ceramics are wonderful, colourful and in my opinion the best for gratin dishes, and stacked pasta dishes such as lasagne. Ceramics are stylish and with proper care are very long lasting. For everyday convenience and ease, go for stainless steel but choose good quality. Whatever your choice, make sure you buy good quality and do take health concerns into consideration. Thanks alot of thorough and informative article, really helpful ;)! I have searched multiple places for reading about the different types of cookware and yours by far is the best, and contained all the information in one place! I will be saving your page for future reference. Excellent and Thank You! Hi, very nice post. Thanks for this useful information. shared it on my twitter page.